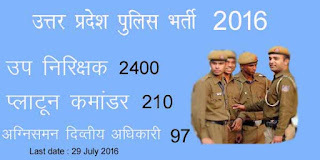 Uttar Pradesh police invites male and female candidates to fill up 3300 vacancy for the post of Sub Inspector, Platoon Commander and Fire Second Officer. Scheduled date of examination : Yet not declared. Application fees:- Rs 400 for all vacancies through SBI E-Challan or Internet banking or Debit credit card. Age limit:- Candidates who are aged between 21 to 28 years, are illegible to apply. Age relaxation will be given as per state government rules. Education Qualification:- Candidates must have completed graduation from any recognized University. Candidates who are applying for Fire second officer must have graduate from science stream. Application is available online Mode only. Candidates need to visit official website http://prpb.gov.in. After visiting click on "Candidates Registration" button and fill the required fields. 3 Third Step :- After submitting application fees candidates need to upload photo and self signature. After completing all te information click on view application form and click on submit button.